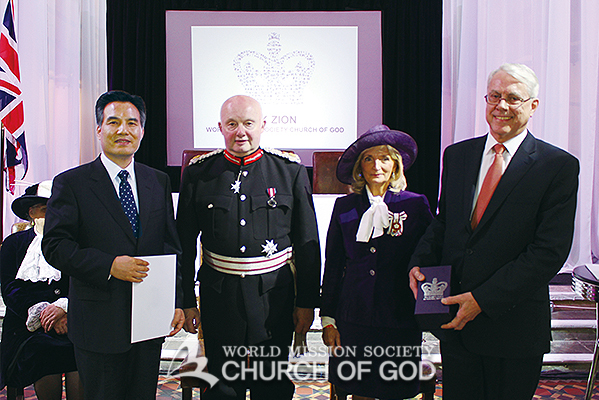 General Pastor Kim Joo-cheol of the Church of God (left) received the award certificate signed by the Queen from the Lord Lieutenant of Greater Manchester Warren Smith (second from left). 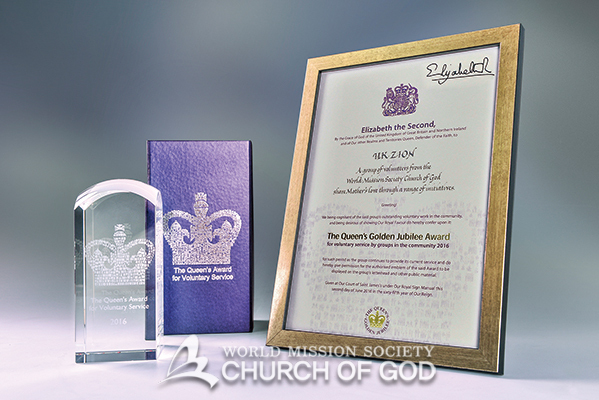 The Church of God received the Queen’s Award for Voluntary Service on June 2, 2016. It is the highest award for volunteer groups in the U.K. in recognition of their outstanding work done in their communities. The award’s prestige is acknowledged in 53 member states of the Commonwealth such as the U.K., Australia, New Zealand, and India, where 2.2 billion people reside. The Church of God has carried out different types of volunteer services such as emergency disaster relief efforts, cleanups, blood drives, supporting local activities, helping farmers, and visiting welfare facilities and public offices; wherever a helping hand was needed, the church went to aid. In recognition of its sincere volunteer services, the Church of God has won over 2,000 medals, awards, and plaques from governments and organizations around the world. 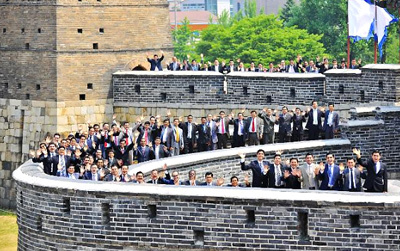 The Queen’s Award is more meaningful as it is another best group award from the head of a country after the U.S. President’s Volunteer Service Award and the Korea Presidential Group Citation. The Queen’s Award for Voluntary Service was created in 2002 to celebrate the 50th anniversary of the coronation of Queen Elizabeth II. It is an annual award managed by the Cabinet Office. Groups must have been benefiting local communities with a minimum of three years of continued volunteer services. Through the U.K. government’s thorough and rigorous assessment, the award is given to groups that receive support and respect from citizens. Procedure for assessment and selection is meticulous and prudent. Each nomination is first appraised in the county where the group works by the Lord Lieutenant, helped by a County Assessment Panel. Then, a Specialist Assessment Panel judges nominated groups against the award criteria. The panel passes its recommendations to the Main Award Committee, who advises the Minister. The award is finally decided after the Queen has given her formal approval. The award is equivalent to the Member of the Most Excellent Order of the British Empire [MBE]. and contacted beneficiaries to confirm its activities’ veracity and sincerity. Finally, after three years of assessment and by the Queen’s approval, the Church of God has been recognized as the exemplary organization that contributes to the community. At the same time, the church has been authorized to use both the Queen’s Award emblem and the British honor of MBE. Before the award ceremony was held, General Pastor Kim Joo-cheol was invited by the Queen Elizabeth II as the representative of the Church of God to Buckingham Palace. Buckingham Palace is the London residence and administrative headquarters of the reigning monarch of the U.K. and admission is by invitation only. 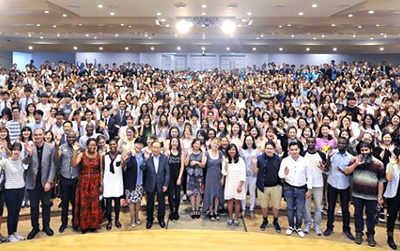 On May 24, 2016, Pastor Kim Joo-cheol participated in the Queen’s garden party, and among a total of 193 invited charities, social enterprises, and voluntary groups, the Church of God was the only religious organization. After the Queen’s garden party, the Cabinet Office officially announced the recipients of the award on June 2, the anniversary of the Queen’s coronation. Then the ceremony was held in each region. In Greater Manchester, it was performed on July 4 at Gorton Monastery, a landmark in Manchester, where Lord Lieutenant Warren Smith, the Queen’s representative, handed the award certificate and the commemorative crystal of the Queen’s Award to Pastor Kim Joo-cheol. People’s congratulations and praises for the Church of God continued at the ceremony. “It doesn’t go unnoticed in the great community of all the excellent work they have done—the actual feats of community, togetherness bringing the community together on the streets, and the voluntary work they do. So this award really is a culmination of an amazing amount of work a lot of volunteers have done over many years,” said Ray Dutton, the Mayor of Rochdale. “Receiving the Queen’s Award for Voluntary Service is a tremendous achievement and you should all be very proud of yourselves. I would like to meet your church and to talk to you about what we could do in the future with you,” said Judith Lloyd, Mayor of Trafford. “Our towns and cities would actually come to a halt without the tremendous work that volunteers do,” said Mike Connolly, Mayor of Bury, appreciating the volunteer services of the members. Mayor of Wigan Ronald Conway and Mayor of Oldham Derek Heffernan also gave congratulatory messages to the church. The Church of God has already been known as the organization that takes the lead in good deeds in Greater Manchester since a few years ago. During the second half of the year 2013, the church received awards and letters of appreciation from all cities and towns in Greater Manchester such as Manchester, Salford, Bolton, Bury, Rochdale, Stockport, Tameside, Trafford, and Wigan. When the London Gazette, the official public record, announced the recipients of the Queen’s Award, many British news media outlets gave major coverage to the Church of God’s winning the award under the headline, “Church gets top award.” “All the church members have been following the teachings of God the Father and God the Mother and doing good deeds as the salt and light of the world. This award attests to their role performance. 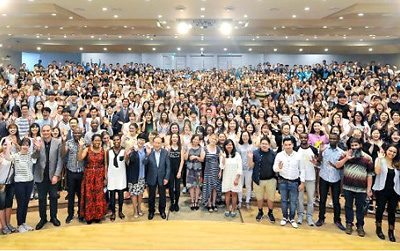 We’ll share God’s love with people throughout the world as their good neighbors like the Good Samaritan,” said General Pastor Kim Joo-cheol, expressing the church’s determination. The Church of God practices love for humanity; it goes wherever a helping hand is needed beyond national and cultural boundaries, according to the teachings of God. The world is paying attention to its sincere moves.